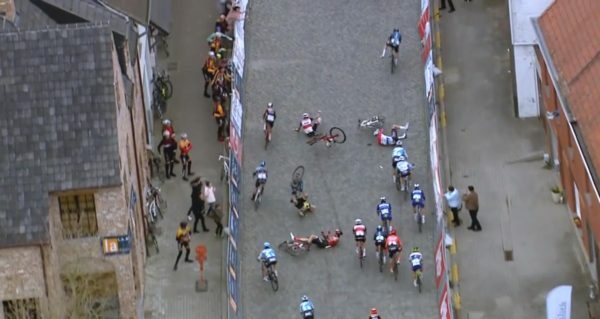 Danilith Nokere Koerse has been marred by this very messy crash on the uphill cobbled sprint. Mathieu van der Poel took the worst if it; falling hard and awkwardly and then being hit by another rider while on the deck. Mathieu Van der Poel went into Danilith Nokere Koerse (1.HC) as one of the favourites today but has left the race by ambulance. The Dutchman, who won the world and European crowns during the cyclocross season, was the victim of a particularly messy crash. The race came down to a bunch sprint on the uphill cobbled finish into Nokere after 195.6km. Max Walscheid (Team Sunweb) was on the front coming into the sprint, performing lead-out duties. He nudge his elbow for his team mates to go past and then seemed to unsettle him on the bike. Initially he almost fell, but he stayed upright and stopped pedalling. That saw him lose speed and drop back through the head of the peloton. When he was about 20 riders back, one of the CCC Team riders hit him. That contact saw Walscheid fall first, bringing down several others. Van der Poel was up against the barriers at the time and came down very awkwardly. To compound matters, after he had fallen another rider then rode into him at speed. And for a long time after the race ended, three or four of the fallers were still being treated on the road. The race was won by first-year pro Cees Bol, a 23-year-old riding with Team Sunweb. He beat Pascal Ackerman, the man Bora-hansgrohe has decided to favour for the Giro over Sam Bennett. Jasper Philipsen (UAE Team Emirates) rounded out the podium. While he was a great win for Bol, the finish was marred by that nasty crash. Van der Poel’s team Corendon-Circus offered an update after the race. It confirmed the Dutch road race champion was not badly injured. “Nokere Koerse didn’t end as we expected. A nasty crash for Mathieu van der Poel in the final straight line,” it explained. “Afterwards they took him away with the ambulance to the hospital. Luckily, no fractures has been determined. #NokereKoerse – Van der Poel is still down with ambulance and medical.